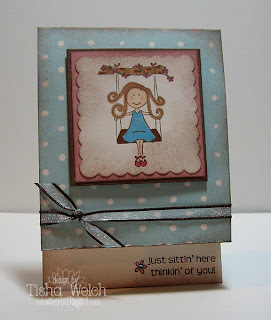 bitter sweet stamping: Shabby Elzy! I was getting in touch with my "inner sponge" and whipped up these cards last week! I liked it so much, and thought of so many people that needed this card that I made 4 of them!! I haven't done this much sponging in a long time, but it worked for me on this card! Now, I just need to get them in the mail ...! I am so bad at that part!! Thanks for looking - have a great day! We are getting pelted by freezing rain and sleet today, so we are going to hunker down and stay in all day! Hopefully I will get some time to stamp! I am beginning to wonder if this winter will ever end!! Details: Stamps by Elzybell and A Muse, colored with Copics, note cards, twinkle stickers and ribbon by A Muse. I love your shabby Elzy's, Tisha! Tooooo sweet! 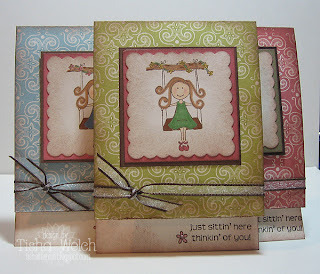 Shabby Elzy is gorgeous! Love all the different colors too!